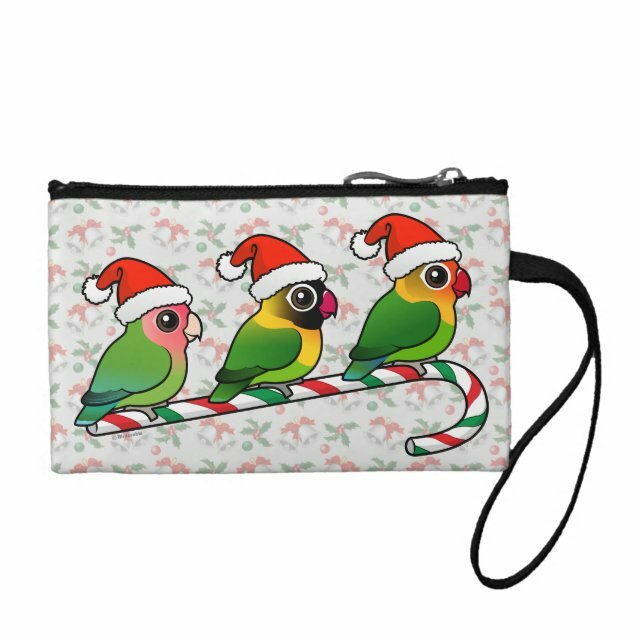 Three Birdorable lovebirds are sitting on a candy cane in this original design made for Christmas! Peach-faced, Masked and Fischer's Lovebirds are all sporting Santa Claus hats, too! This would make the perfect holiday gift for anyone that loves lovebirds -- especially since you can customize it! Add your own text or images to make a truly unique gift! Bare necessities meet your new coin purse! Made with a silky satin fabric and sturdy wrist strap, this coin purse brilliantly displays your designs, text, and photos in vivid detail. Perfectly sized to fit inside more... your purse, you?ll never lose track of your cards, cash, or coins again. Customize with a message for a friend as a gift or add your initials for a special personalized touch!